The Salisbury 5-4-3-2-1 trail run was much harder than I expected and I am pretty sure nobody warmed up before the start. Maybe my mindset wasn’t right from the outset and partly to do with the weather with heavy rain and wind. Regardless for me less pressure for flat-out speed and focus to remain on getting the mileage and the win for confidence. Distances for the race varied from 5km – 50k Ultra Marathon, hence the 5 = 50k, 4 =42k, 3= 33k, 2=21k and 1=10k. The routes were over bridges, footpaths, bridleways and country roads in the Salisbury Wessex area. 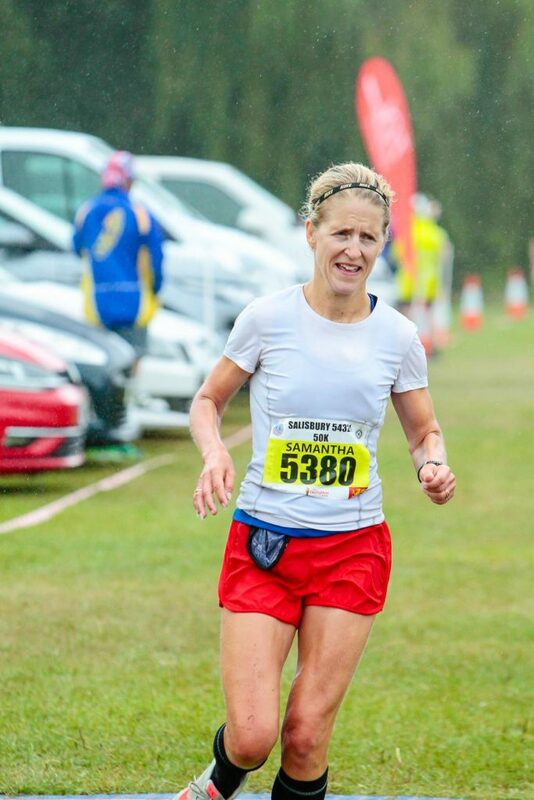 I had no idea my competition not recognizing anyone apart from Cat Simpson another local ultra runner who may push me a bit, she also failed to complete back in May the TP100 due to weather conditions. My coach Norman came also to flyer cars, watch the race and we would have a late lunch after to catch up. According to his thoughts ( proven to be wrong), he was convinced it was a fast course but I assured him it was definitely not flat! With the rain not easing, runners hiding for shelter after registration time was now ticking for the announcements. That part was pretty swift and it was time for us to line up for the start, so I shimmed into a spot close to the front as I knew even for ultra’s especially 50k’s people race off to avoid tight spots. It was very up and down course through unploughed fields, stiles, chalky based hills and the weather added some interesting challenges. The nice parts took you through areas of historical and scientific interest and through Country Estates not usually open to the general public. Dipped massively with energy in the second half, truth be told I thought my flapjacks for breakfast and banana before the start had been enough. The aid stations were very frequent along the course but didn’t have ” quick grab and run” food so I missed many opportunities and therefore paid dearly and became dehydrated ( story of my life this year). Sadly I went from 3rd place to 5th and the overall win for the ladies. Never felt more grateful to see the finish running through the wind and dripping wet clothes. I won in a time of 3.51 which was a respectable time but hoped closer to 3hrs 40 but in hindsight with a race that involved looking a lot at signs, getting lost in a wood and opening lots of gates ” a win is a win”. Sadly the race doesn’t go on your athletics profile but a very well organized and challenging event.